Sen. Carl Levin Confident Psy-Ops Probe Will Get Answers : It's All Politics The Rolling Stone report that a U.S. general ordered a psy ops campaign on U.S. lawmakers is strange news. Sen. Carl Levin, chair of the Senate Armed Services Committee, said he's confident the Pentagon will get to the bottom of the report. 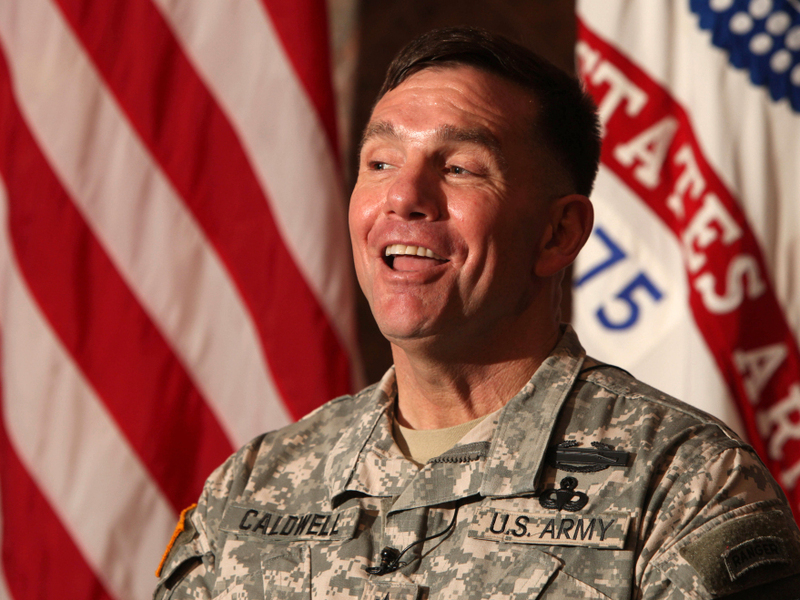 Lt. Gen. William Caldwell IV in October 2009. If we had feature called The Strangest Washington Story of the Week, there'd probably be several excellent candidates most weeks. But few of them would be as eye-widening as the Rolling Stone report that an Army general allegedly ordered a psy-ops campaign on congressional delegations or codels visiting Afghanistan. My colleague Mark Memmott provides details on the latest scandal involving an Army general in Afghanistan over at The Two-Way blog. But here are some anyway. According to a Rolling Stone magazine piece published late Wednesday, Lt. Gen William Caldwell allegedly ordered his psychological warfare experts to employ their skills on visiting members of Congress to get them to support more money and troops for the NATO effort in Afghanistan. Besides their aversion, like most other people, to being manipulated lawmakers are upset by the report because the use by U.S. government agencies or the military of propaganda tools against American citizens is illegal. General David Petraeus, the top U.S. commander in Afghanistan promises a thorough investigation. Lost on no one is that a Rolling Stone story has already ended the career of one U.S. combatant commander in Afghanistan, Gen. Stanley McChrystal, Petraeus's predecessor. McChrystal's career ended, of course, after Rolling Stone published unflattering remarks he and his aides made within earshot of a writer about members of the Obama Administration. Meanwhile, Sen. Carl Levin, chairman of the Senate Armed Services Committee and reportedly one of the targets of the , suggested that if the general was really trying to do what he's been accused of doing, the officer was preaching to the choir. "For years, I have strongly and repeatedly advocated for building up Afghan military capability because I believe only the Afghans can truly secure their nation's future. I have never needed any convincing on this point. Quite the opposite, my efforts have been aimed at convincing others of the need for larger, more capable Afghan security forces, and that we and NATO should send more trainers to Afghanistan, rather than more combat troops. I am confident that the chain of command will review any allegation that information operations have been improperly used in Afghanistan." So Levin is confident the Pentagon will get to the bottom of all of this. But how can we be sure the senator's confidence isn't the result of another military psy-ops campaign? I'm joking, of course.